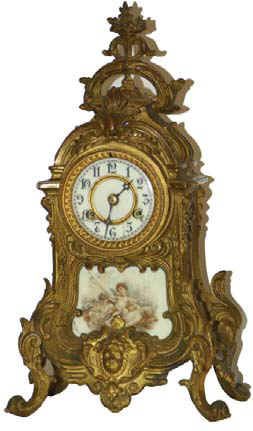 Waterbury Clock Co. metal case mantle clocks, the "Nantes", ca 1915. When it left the factory it was richly gold plated, but now shows a great deal of the gold worn. It doesn't look bad, and a light cleaning would help it, but none the less looking dull. The beveled glass is missing but everything else is intact and original. Nice clean, round, brass 8 day movement strikes a cathedral gong on the half hours and hours. The 2 piece porcelain dial has chips around the wind arbors and a couple of dirty hairlines. The 15.5 inch metal case has attractive and interesting designs on all four sides. Ly-Waterbury #1246. If it was in a little better condition I could expect to get bids in the 500 dollars -600 dollars range, as it is more like .